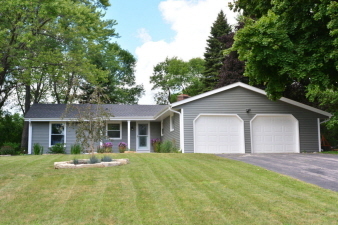 Spacious Waukesha Ranch on a quiet street. Better than new! This inviting, modern style Ranch home has been completely updated. The large kitchen features new appliances. Sliding doors off kitchen lead to a wonderful screened-in porch. Open living room has new carpeting. Sliding glass doors from the living room lead to fenced-in back yard with patio. A two-sided fireplace warms both the family room and living room. Updated full bath. Newer roof (2010), windows, trim and siding. Two car garage. Updated and beautiful - schedule an appointment to see your new home.